My son decided he wanted to have an underwater shark attack birthday party for his fifth birthday. I took the idea and ran with it. I made homemade invitations (from construction paper) I cut out a shark mouth from blue and added teeth, I put a fish inside the mouth with all the party information on it. For decorations I decided to make an underwater theme by hanging inflatable fish and clear balloons and various heights from the ceiling. We used green crepe paper for seaweed and shark cut outs. We gave the kids goggles instead of party hats. 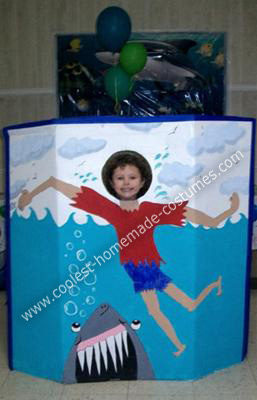 I made a shark attack photo prop by using cardboard and paints, I drew and painted my design and cut out a head hole for picture taking (this is a BIG hit). 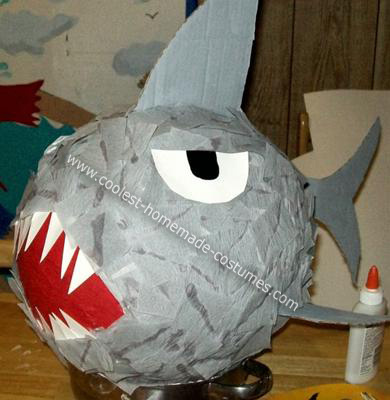 I made a Shark pinata. Blow up a balloon, mix flour and water to a glue-like state and dip strips of newspaper into the mixture. Cover your balloon and let dry overnight. Once dry, pop balloon and cut a hole to fill with candy and a hole to hang it from. I cut fins from cardboard and attached them with hot glue. I painted the mouth red and started adding squares of gray crepe paper, I cut out teeth from card stock and glued them on (only put glue on the bottom of the tooth for an ope mouth effect.) Tanner LOVED this! For more activities and games we played “Pin the Fin on the Shark” and “Pick and Pop” (put pieces of paper into balloons before you blow them up and draw a shark on a couple…. if they have a shark they win). We gave away shark tooth necklaces for prizes (cheap on eBay). 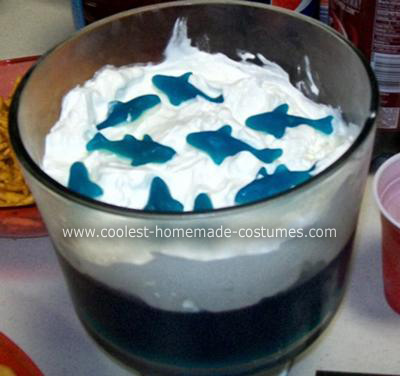 We had “Seanut & Jellyfish” & “Shark Bite(tuna)” Sandwiches, Shark Crackers and I made and edible ocean using blue Jell-o, whipped cream and gummy sharks. It was a GREAT party!!! 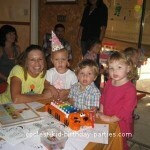 What an awesome party!! 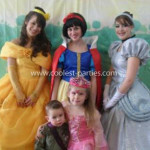 We are going to use many of these tips for our sons next party. Thanks for sharing! Fantastic, thanks for your great ideas! 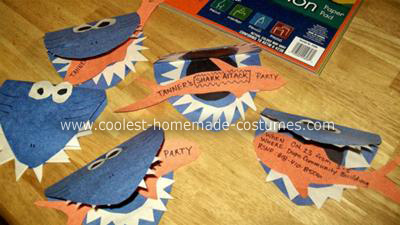 My son wants a shark party for his 5th and this is perfect. I am totally stealing your ideas! I’m not very artsy but my 7yr old is helping and she is. I love the Jello idea. Thanks creative Momma!